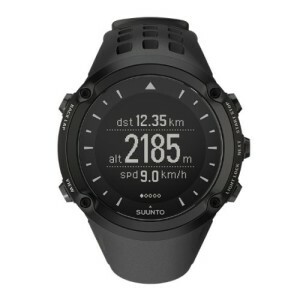 The Suunto Ambit GPS speed and distance outdoor sports watch is water resistant to 100m (328ft) and upgradeable with new functionalities through Movescount.com. The watch is ideal for backcountry skiers, hikers, trail runners and mountain climbers, and especially valued for its exceptional durability, reliable altitude measurement and water resistance. It offers an altimeter, barometer, GPS navigation system, as well as a 3D compass with advanced heart rate monitoring. The Suunto Ambit combines the advanced training and heavy duty outdoor features which makes it perfect for the explorers. In addition, it has a rechargeable lithium-ion battery and comes with 2 years warranty.